5 blog hopes for 2007. 4. To have a great set of emerging church postcards and make them available as hard copy through lulu. 5. To develop an interactive on-line community around the missional reader project. : John’s Christmas is God giggling. On each nappy was a different visual image, taken from a contemporisation of the Book of Kells. The images had been digitally scanned and, using inkjet printer transfer paper, ironed onto the nappy. So each nappy represented a different gospel. So the Christmas response was the invitation for people to come and rip a piece off the nappy from the Christmas that most challenged them. So if you look closely, John’s gospel got a thrashing. This is the Christmas worship moment I like best – mixing the stars. After each Christmas service, the pastoral team sprinkle little stars over everyone; with the blessing “May Jesus Christ, the true star of Christmas, shine on you today.” It is quite a special moment, individually “blessing” each person with sprinkled stars. 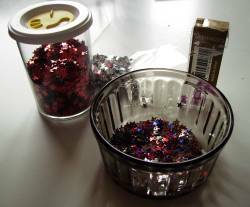 I love mixing the stars before worship; getting the blend of blues and reds and golds. I love that people find them for days afterward, in their sheets and pillows. That for me is what worship should be, sustaining us in our everyday lives. This was a comment made to me at the door, after the service, this Sunday morning. e) what has been your best mission moment in 06?. My authors copy of Proclaiming the Scandal of the Cross arrived today. 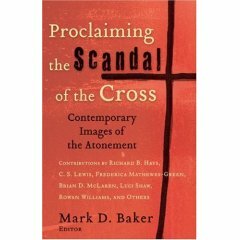 It is such an important book; offering 18 sermons on preaching the atonement today, putting contemporary preached wheels to the multiple images of the atonement in the Bible. I have already used 3 sermons from it as case studies in my Living the Text class at Fuller Theological Seminary. There are sermons from CS Lewis, Rowan Williams (Archbishop of Canterbury) and me. A little Kiwi! Sandwiched between New Testament scholar Richard Hays and Brian McLaren. “There is then a twofold work for those projects involved in developing transformative practices of hope: the work of generating new imaginary significations and the work of forming institutions that mark such significations.” (Ward, Cultural Transformation and Religious Practice , 2005, 146. This captures so much of the pain around the emerging church movement. The emerging church movement is gift as it embraces the work of generating new imaginative acts of church and worship. This is what drew me to the alternative worship movement back in 1995. 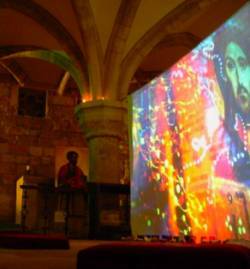 I saw a picture of Visions in York in worship, projecting multiple slide images on church walls. Their imagination allowed my eyes to catch a glimpse of what it might mean to worship God body, mind and soul. Time and again I have seen in the emerging church glimpses of new ways of being church, renewed missional practices, Incarnational worship. At the same time, I have seen emerging church groups remain profoundly distrustful of institution forming. Leadership and structures are often a dirty word. Listen closely and you hear stories of abuse. Yet Ward reminds us that our imaginative task is always two-fold. We need the breathe of new life and generative power for institutional life. Equally, I have seen the emerging photocopied. The challenge is not to reproduce Visions worship on your wall. Instead it is to worship God body, mind and soul, Incarnationally in your context. Creativity is never formless and void. It always looks for the containers of time and space that will mark day from night, form from void. Such institutions are never timeless, but rather contextual markers that best fit the new imaginations. Such is the hard work of the church emerging. It is easier to despise the church of your fathers and mothers than to hoe the hard yards that are the forming of contextual containers for a new day. I have been working on Mary’s song in Luke 1 this week. At base it is a song. It is a creative response to the generative and birthing work of God. 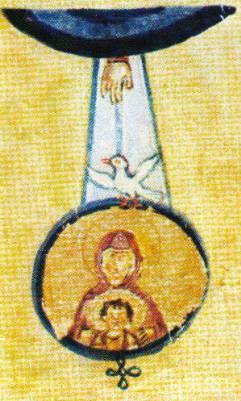 As the Spirit of God hovers over the waters in Genesis 1, so the Spirit of God hovers over Mary’s womb. 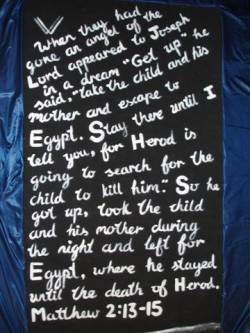 The Christmas story in Luke offers 3 other new imaginations, the songs of Zechariah and Simeon and the angels, that hum into life around the birth of Jesus. Mary walks in a long line of Biblical woman, like Miriam and Deborah and Hannah, who sing in creative response to the work of God. Mary’s song invites us to respond to the generative work of the spirit with new imaginary significations. Mary’s song offers a theological imagination. Mary seems little interested in singing in a song in response to sociological observations of church practice and church decline. Instead her song emerges from her personal narrative of excluded woman and young teenage. So must all our songs, for God dwells among the stories of the poor and dispossessed. But Mary’s song refuses to remain stuck in her moment. Instead it becomes a form, a contextual hum, that will shape a movement toward God for the poor and marginalised. Such is the task of mission today. To sing Mary’s song for our day, bounded by our context, listening to the stories of God in life, in response to the hovering work of the Spirit. May the power of God’s Spirit be twofold this Advent, to breathe new imagination and generate institutional life, for the sake of the poor we pray, Amen. I have a group in the US who have asked me to speak in the Los Angeles area either May 19, 20 OR June 2, 3. All expenses are paid but it is a long way to go and a lot of personal energy for one gig. Are there any other groups around the Pacific Coast-area who could use me either side of these dates? - in Los Angeles July 9-13 at Fuller Theological Seminary (pencil booked), then Seattle 16-19 July. Contact me if I am in your area and you think I could help your emerging and missional church conversations around any of those dates. I can consult and converse and speak. I am playing around with discipling options for next year. We already have 1-1 options around growth coaching. But we’ve been playing with adding in block course based options. My underlying principle is: multiple options for multiple learning styles. 2 : a storytelling option, (more on this as it develops cos it is something that is being Opawa designed. 3 : a content based option. I am quite drawn to Living Faith by Tom Wright, because I like the breadth of topics (including 5 on the Bible plus Christian history). Just wondering if anyone out there has used either Tom Wright stuff or the Nooma videos in discipleship? If so, what was helpful? what was not? Only answer if you’ve used them small group and discipling contexts (compared to in a worship service context). Pernell has tagged me: 5 things you probably don’t know about me. 1. My brother Mark died at birth. I never met him and I’ve missed him more and more in the last few years. I find that a bit wierd. 2. I used to love marmalade as a kid. I used to spread marmalade on every one of my pieces of toast and school lunch sandwiches. Then suddenly one day I hated marmalade and didn’t touch it for years. 3. My favourite books growing up were Biggles books. As a kid I was intrigued by the fact that Biggles never seemed to go to the toilet. 4. I stand responsible for my younger brother badly burning his feet. I managed to con him into running across the smouldering ashes of a bonfire. Half way across he just started screaming. 5. My favourite movie is Jesus of Montreal. I love the musical score and the urban landscapes. And I tag Tash McGill, Laura Drane, Darren Wright, Steve Garner, Fernando Gros. 8 shipping containers, placed in the centre of Christchurch, around the Christchurch tourist tram route. Each is wrapped in fabric. These are gifts, each an interactive art installation, waiting to be unwrapped, a present to our city, telling part of the Christmas story. While this is a huge undertaking, the Lectionary Scriptures for today were of immense encouragement to the tired and stressed and nervous among us, for in Daniel 5, God writes on the walls of the place. God’s words are displayed in the corridors of power. Interestingly, sown into each shipping container are scriptures. The words of God hang on container walls, around our city. Today, as in Daniel’s time, God’s words are being written on the walls of our city, in the places where lawyers walk and shoppers shop. We at Opawa rejoice in being God’s handwriting. And we pray that today, as in Daniel’s time, our city might have the wisdom to discern the words of God. Open from 10 am to 9 pm (hours of the Christchurch tram), from Saturday December 16-Sunday December 24. This is part of Opawa Baptist and Side Door Arts Trust gift to the city in 2006. This is public mission, taking Jesus back out of church and telling his story in our marketplace, in the City Square and outside the Art Gallery and Museum. After months of negotiation, we gained Council permission 3 weeks ago. We have been scrambling ever since. In an ideal world, each container would have a person at the door, to offer welcome and provide security. If there are any Christchurch readers of my blog that have 4 spare hours between now and Christmas, please email me, steve at emergentkiwi dot org dot nz, as we desperately need volunteers. How would you express the annunciation of Jesus as a visual image? Many of us like to doodle on paper as we listen. So how would you doodle the angel appearing to Mary and announcing the impregnation? Here is a marginal manuscript, a sort of doodle from the 9th century, from the Byzantine Khludov. It comes from After the After the Spirit. A Constructive Pneumatology from Resources outside the Modern West (a fascinating book by Eugene Rogers) and I used it on Sunday. I then noted the Christian belief that the economic Trinity = immanent Trinity; that what God does = who God is. That God in Jesus acts the same before he was born as during his life, and as he will come again. That God starts (God has a surprise for you. Luke 1:30); that Spirit works (the Holy Spirit will come upon you. Luke 1:35); that creation matters (You will conceive in your womb and bear a son, and you will name him Jesus. Luke 1:31). It led me to offer the following table; integrating the Trinity with Jesus birth, Jesus return and communion. We concluded around the communion table. Often at communion we just look back, memory of a night 2000 years ago. Yet in communion we are entering into Jesus, the economic Trinity = immanent Trinity, that Jesus acts in the Bible is the same as who God is before the Bible. Christmas can be a very busy time. We have presents to buy, food to prepare, a long list of social functions and breakups. And it’s easy to get tired. When I do, when I get tired in December, I return to this doodle. The reminder that it is not my energy, for God starts, for the Spirit is working and that as creation matters and God wants to touch our human bodies with God power. As we come to communion: you might like to think about: What is God starting in you? Where is the Spirit working? Now last year I was very United States-allergic. I was tired of the way that the emerging church was so often reduced to emergentUS. I thus refused to accept any American postcards. It was a blog-stake in the ground, because I wanted to provide a visual reminder that the emerging church is global, not American. This year I repent! I am accepting US postcards. However, I will only post them in proportion to their percentage of world population. That’s 5% (according to here). So, for every 20 postcards I get, I will post one from the United States (in the order they come from the US). 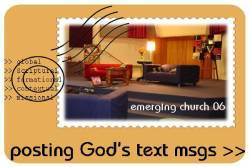 Why emerging church postcards 06?